Dr. Sandip is currently associated with Regency Hospital as a Consultant in Radiation Oncology. M.B.B.S – M.K.C.G Medical College – Berhampur Odisha. 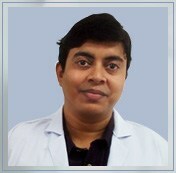 Trained in modern radiation Oncology techniques like SRS, SBRT, IGRT, VMAT, IMRT. Interstitial Brachytherapy and Image guided Brachytherapy. Awarded from J.M Pinto Gold Medal in 2012.